Why are you letting your waste hoard on your property? It is time to consider which large bin is available for you. 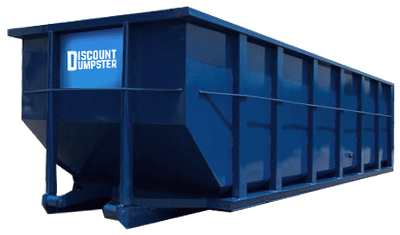 At Discount Dumpster we work with local disposal agencies in Aurora to ensure consistent service all around. We don’t want any confusion once your project is finished. From beginning to end you will know who handles your waste. Call our sales team in order to have your roll off by tomorrow morning. Our open top dumpsters are built for any residential or commercial junk removal effort. You can choose among 10, 12, 15, 20, 30, and 40 cubic yard containers. We transport most forms of refuse, although we cannot allow flammable and hazardous substances in the open tops. Our phone operators can assist you Monday through Friday during normal business hours with additional info. The 10 yard bin is ideal for most small-scale demolitions. Its compact size allows for easy delivery and pickup. The 10 yard allows you to transfer sheet rock and brick refuse. This dumpster is ideal for residential projects. Whether you are cleaning out your home, garage, or attic a 12 yard container works. Able to fit on most all driveways. Slightly longer than the 12 yard container, the 15 yard can be a great tool for DIY clean outs. The 15 yard’s size allows you remove clutter such as broken furniture and glass. Its low height makes for walk in loading of heavy debris. The 20 yard roll off is common for transferring landscaping material. You can take grass and soil to the landfill. 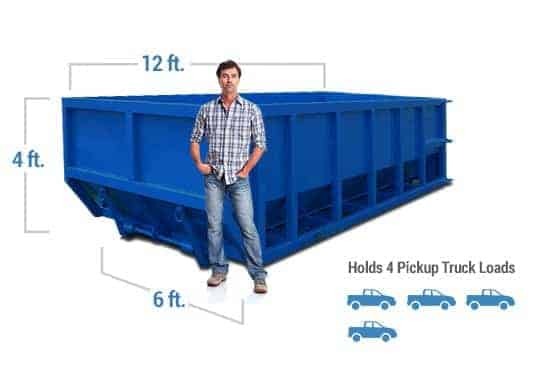 The 20 yard is a great alternative to taking heavy items to the landfill. 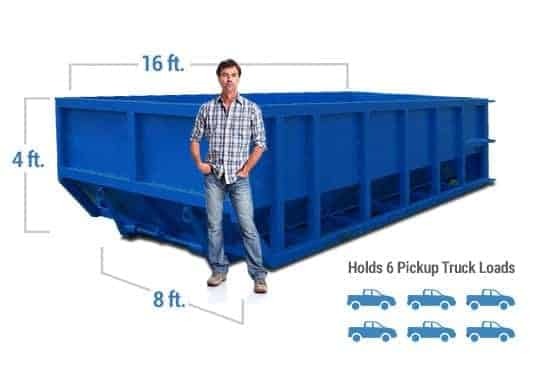 Smaller than the 40 yard bin, the 30 yard is for business owners with refurbishing projects. Its relatively large size allows the bin to hold heavy renovation trash. With 30 cubic yards of space, you can move construction material from the site. Our 40 yard container is mostly rented for completing building planning. You can transport up to 15 pickup loads of unwanted debris. It is a great tool for any apartment renovation or remodel. Discount Dumpster believes that many options make for better customer service. Our team is available Monday through Friday to take your call. We can offer advice on which roll off is best for your project, as well as give consultation on dumpster sizes. Our open tops are ready if you need a rental by tomorrow morning. They are very durable and can clear up to 15 pickup loads of rubbish. Let us know what is going on when you call. Discount Dumpster wants to save you money on your roll off rental. We know that you like to see your funds grow. We offer open top dumpsters at the lowest pricing in the state. You never have to worry about hidden surcharges. Our rates are clear from your initial phone call. Call today to see which dumpster will save you in the long run. We can have your order set up in less than five minutes. There is no more time to waste. You should have started that cleanup yesterday. Now you have more garbage than ever. With a 40 yard roll off (or two 20 yards) you can have that junk in the landfill immediately. As a convenience we provide 10, 15, 20, 30, and 40 yard bins built for any waste management task. Call us immediately and have an open top dumpster on location by tomorrow morning. Do I need a permit for a dumpster in Green Valley Ranch? In certain cases a permit is required when renting a dumpster. The city of Aurora requires a right of way permit if the dumpster will interfere with pedestrians or traffic on the street/ sidewalk. There is a minor application fee for the dumpster permit ranging from $50 to $75. However if you plan to place your dumpster on your driveway or private property it is not necessary to get a permit. Discount Dumpster will simply roll off the container directly where you need it. That way you are able to keep costs to a minimum. The quickest and easiest way to rent a dumpster is to call our office. As Colorado’s urban communities continues to grow, so does its need for efficient disposal companies. As soon as you rent a dumpster from us, you may expect fast delivery and a speedy pickup when your construction project is through. Our scheduling makes the process even easier for you to clear the way to the city’s next big ‘it’ venue sooner. Whether looking to get your brewery off the ground or plan to start the next Pure Bar studio we are here to help.